Synopsis: A grumpy Grinch plots to ruin Christmas for the village of Whoville. 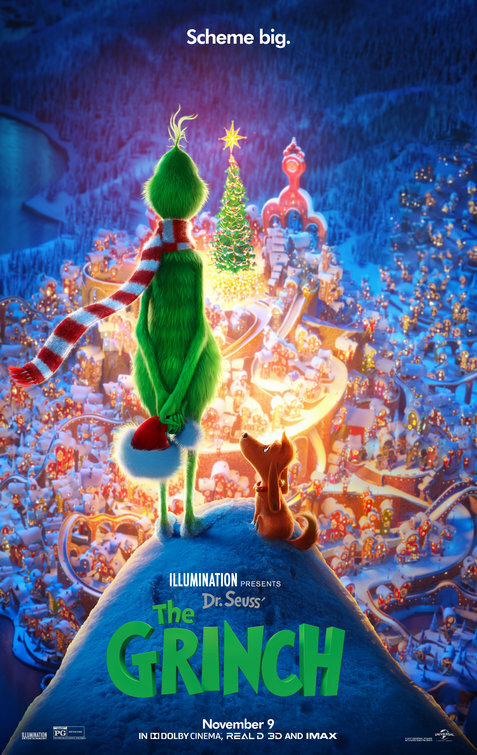 Review: It’s probably wrong to admit it, but I went into the screening of The Grinch actively trying to dislike it. I didn’t see the point of yet another retooling of the classic Dr. Seuss tale when there was already a perfectly wonderful book from 1957 and classic holiday special from 1966 that have stood the test of time. Though Universal had already tried to bring The Grinch to life in 2000’s ghastly How the Grinch Stole Christmas featuring Jim Carrey as the green meanie, it didn’t weasel it’s way into the holiday canon and is widely regarded as a majorly misguided misfire. 18 years later they’ve teamed up with Illumination Entertainment (the animation group behind the Despicable Me and Minions movies) for a colorful retelling of the familiar tale and, as much as I wanted to dismiss it, I found myself succumbing to its charms. It’s the week before Christmas and the tiny town of Whoville is getting ready for the big day. Houses are decorated, presents are bought, the holiday spirit radiates out of everyone. Overlooking Whoville is Mount Crumpit, home to The Grinch (Benedict Cumberbatch, Doctor Strange) who can’t stand Christmas or the Whos. As Christmas Day draws near, The Grinch comes up with a plan to steal Christmas from the Whos, hoping to prevent Christmas from coming. Dressed up as Santa, The Grinch makes his way through Whoville on Christmas Eve robbing the sleeping Whos of every speck of yuletide garb and gifts, aiming to toss it off a cliff. Unless you’ve been living under a rock and never allowed to watch television you know how it ends up, so it’s not a spoiler to say that eventually The Grinch welcomes not only Christmas into his heart but the Whos as well. Screenwriters Michael LeSieur (Keeping Up with the Joneses) and Tommy Swerdlow have taken the original 69 page book by Dr. Seuss and expanded it to a 90 minute family friendly film that maintains the structure sourced from Seuss. Most of the rhymes are still there in the narration from Pharrell Williams but the screenplay adds in extra material for The Grinch and especially Cindy Lou Who. The 2000 script for the live action film was similarly overstuffed but it was in service to special effects and production design, not story. Here it feels more organic and in line with giving the characters a more modern feel. That may displease purists who appreciate the simple joys of the original Seuss tale and even though I’d count myself as one of them I didn’t really mind the updates. More time is spent on carving out distinctive personalities for several of the Whos. Cindy Lou Who’s mom (Rashida Jones, Tag) is now an overworked single parent raising her daughter and twin boys and Bricklebaum (Keenan Thompson), the merriest Who of all, is all about having the best holiday decorations on display. Angela Lansbury (Beauty and the Beast) is heard briefly as the mayor of Whoville ready to light their enormous tree and who tasks the Whos with making Christmas three times as big as last year. Cindy Lou herself (Cameron Seely, The Greatest Showman, whose animated alter-ego looks strikingly like Amy Poehler) is a tom-boyish do-gooder that wants to forgo presents and ask Santa to help her mom out instead. Her infamous meeting with The Grinch during his nighttime burglary is now orchestrated by her as a way to get some face time with the guy in the red suit. As The Grinch, Cumberbatch has the unenviable task of following in the aural footsteps of Boris Karloff who voiced the green guy in 1966 and did the narration as well. His Grinch is more nasal and nerdish, less outright cruel but still just as unflinchingly mean. It was wise for the writers to ease up a bit on his harsh-ness because sitting through even an hour of that would be something he could never bounce back from. Time is spent exploring his history and explaining why he hates Christmas so much as well as providing moments of interplay with his faithful dog Max and a new character, a rotund reindeer named Fred. I wish the filmmakers would have let Cumberbatch narrate the film as well in his deep accented voice, Pharrell’s reading just doesn’t land with any weight. While the score from Danny Elfman (Dark Shadows) is a nice callback to the original tunes from 1966 there is a fairly awful reworking of ‘You’re a Mean One, Mr. Grinch’ and a positively hideous closing number, both performed by Tyler, the Creator. Though the soundtrack is filled out with other holiday numbers, I was a bit taken a back that ‘God Rest Ye Merry Gentlemen’ and the phrase “Remember Christ our Savior” was featured prominently in one comedic sequence. In a film aimed at international audiences across all religious beliefs, it was an interesting inclusion on the part of the studio. As we near our own holiday season there will be a host of movies out there for families to choose from and I’m pleased that for a second week in a row we have a movie that I’d feel comfortable suggesting as an all-ages option. The Grinch is rated PG for brief rude humor and honestly, I don’t even remember what that was. It’s refreshingly free of fart jokes and bathroom yucks and, like The Nutcracker and the Four Realms is a movie parents will likely be as entertained with as their kids. Please promise you’ll watch the 1966 version first, though!